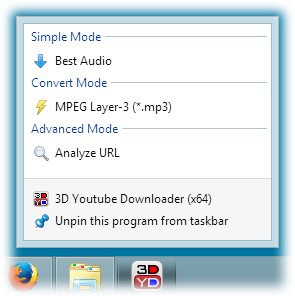 For Windows7 and above each mode is also represented by the task in Windows Taskbar tasks list. Each task starts new program instance and uses an URL from the clipboard. For Simple Mode there is selected the last used download target. The same target is used in Convert Mode and there is displayed the last used format for this target. If you use presets, they also will be listed in Taskbar tasks. Presets are displayed in the order of last use, more recently used presets come first. 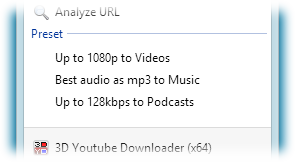 Number of presets to display is limited only by Taskbar settings. Usually there are limit of 10 items. After substraction of three items for work modes we have limit of seven presets to display. In order to change this number invoke task bar context menu and go to Properties » Jump Lists » Number of recent items to display in Jump Lists.